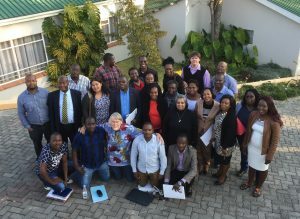 Professor David McQuoid-Mason, President of CLEA, gave two interactive presentations at a Clinical Legal Education Conference for 11 African countries in Harare, Zimbabwe on 4 August 2016. McQuoid-Mason was invited to present the Keynote address to delegates from Namibia, Malawi, Zambia, Mozambique, Lesotho, Swaziland, Botswana, Kenya, Tanzania, Zimbabwe and South Africa at the Conference which was hosted by the Midlands State University in Zimbabwe. The other presenter at the Conference was Advocate Asha Ramgobin, a former Director of the UKZN Campus Clinic, and now Executive Director of the Human Rights Development Initiative in Pretoria. McQuoid-Mason’s first interactive presentation was a Keynote dealing with ‘Establishing and managing law clinics’, during which he dealt with the different types of clinics; overcoming resistance to the establishment of law clinics; the skills, knowledge and experience required of law clinic staff; recruiting students for the clinic; obtaining credit for student work in the clinic; management of the clinic; and how law students, law staff, the universities, clients and potential employers all benefit from a university law clinic and clinical legal education programme. During the course of his presentation McQuoid-Mason used what he calls ‘The Violinist-technique’ he based on the award-winning movie in which the Director presents the cinema-viewers with a blank screen so that they can ponder what might happen before showing them the next scene. In his presentation McQuoid-Mason exposed the delegates to a blank PowerPoint screen with just the topic heading, and invited them to reflect on their experiences of the topic in their own countries, before giving them his experience which was largely based on his founding of the UKZN law clinic. It was interesting to discover that even though the UKZN law clinic was established in 1973, many of the challenges experienced then were still relevant to the present experiences of most of the delegates from the countries outside of South Africa. McQuoid-Mason’s second presentation was on ‘Community engagement through Street law’. This presentation included a definition of Street law; the objectives of Street law; the historical background to Street law; the teaching methods used in Street law; the teaching materials used in Street law; the types of work done by Street law students; how Street law can be integrated into the law curriculum; the community service component of Street law; Street law and social justice; and Street law beyond South Africa. Once again McQuoid-Mason used his ‘The Violinist-technique’ which evoked a lively discussion from the delegates and many of them indicated that they would like to introduce such programmes in their countries. This entry was posted in Events, Regional News and tagged Clinic, South Africa, Southern Africa, workshop, Zimbabwe. Bookmark the permalink.